How to make a chia egg - it's a replacement for egg white made of... crushed seeds. 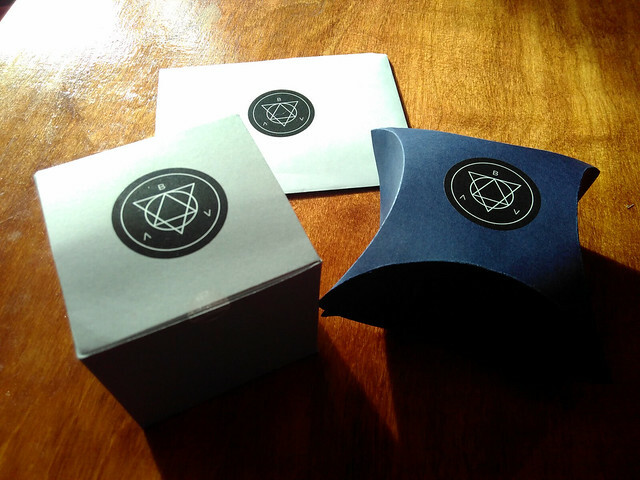 Probably the main party-trick I learnt, since I already knew some of the other vegan voodoo secrets (e.g. aquafaba). Coconut becomes a bit of a fallback for creamy or fatty things: coconut cream, coconut oil, coconut milk... not too healthy to have too much of that! THERE@S MILK EXTRACT IN EVERYTHINGGG. This evening I picked up a pack of gnocchi - presumably just made of potato - and looked at the back... milk protein - gah! Vegan cheese: avoid Violife. Vegans will tell you "Oh this one tastes OK, this other one is good if you..." - don't listen to them! Violife will put you off vegans AND cheese! On the other hand, oat milk (Oatly) is ace alternative milk, and can be used for a surprising number of baking recipes with no problem at all. I've cooked Yorkshire puddings, quiches, all kinds of things with it. You know, I didn't miss real cheese much, but that's probably because a month is not too long really. Didn't even get round to trying all the recipes I wanted to try. Had some lovely vegan junk food (shout out to Vivera shawarma, not to mention McSween's veggie haggis). And for the record, as well as to show you all how interesting Veganuary can be if you like cooking, here are some of the delicious things we cooked+ate! Going to try veganuary? We're going for it this year. 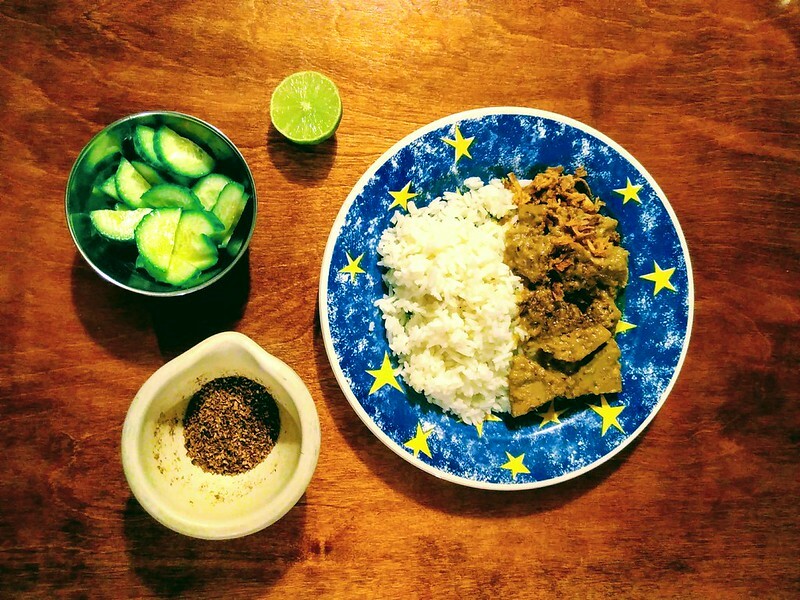 Gado gado - an Indonesian dish that's popular in the Netherlands, and with good reason! Fried tofu, fresh salad veg, potatoes, peanut sauce and crispy onions. - of course you'd be leaving the traditional boiled egg out of the recipe, but that's fine. We made our own echt peanut sauce but you can buy it. Vietnamese banana and coconut cake - ah, I have this in a little recipe book here (Vietnamese Fusion by Chat Mingkwan) and I need to type it up. It's basically white bread, sliced bananas and sugar, layered up, soaked in coconut milk (plus a touch of vanilla, brandy, cinnamon for flavouring) and then baked. So, it becomes a kind of bread pudding. Next I want to work out how to cook "beet wellington" and how to make vegan mayo. Tips welcome! Why, if you're in a pub in Britain, and you don't want to get drunk, are you supposed to drink litres of sugar? Fizzy drinks are like that, but also so are the fruit-juice based things like J2O - waaaay sweeter than beer or wine. What should pubs serve? There are loads of options! Apfelschorle. Common in Germany, this is apple juice mixed with fizzy mineral water. I had this in Germany and I noticed what a good drop-in replacement it is for beer. It's nowhere near as sweet as fruit juice, and has some of the same refreshing fizzy clarity of lager. Obvs it's nowhere near the same as lager but still a great drink for when you don't want to drink. Iced tea. Even if it's simply bottles of Lipton Ice that'd be OK. But, as is common in some parts of the USA, it'd be great to brew up a nice big vat of fresh iced tea each day, especially on hot days. Tea is very very cheap to brew up so pubs should be able to do a good markup on it. Club Mate. It's a sort of not-too-sweet soft drink made from "mate" and allegedly popularised by the Chaos Computer Club or something. Just like the other suggestions, it's got a beer-like bitterness and is unsweet enough that you can drink it in pints. Alcohol-free beer...! well OK this is obvious enough - most alcohol-free beers taste a bit odd, of course. My favourites are Brewdog's "Nanny State" and Claustenhaler's alcohol-free lager, the latter being very convincing German lager. ... But then, now that I've written down the arguments in favour of apfelschorle and iced tea, I'm starting to wonder why we're buying more of these expensive alcohol-free beers. Maybe we're missing a trick. What strikes me is that the branded bottled options are of course the ones that get promotional effort, yet almost all pubs could easily set up with home made iced tea or home made apfleschorle with very little overhead. What do vegetarians really eat? I seem to know more and more vegetarians. (The official stats say it's growing and growing in the UK, so it's no surprise.) Me too. And for some reason, I was wondering, what does everyone tend to eat, on an ordinary weekday evening meal? Although it's nice to share recipes and maybe even food photos, that's a completely different thing from the mid-week everyday cooking. "Pasta with courgettes, toasted pine nuts and goats cheese. Then I had some strawberries and blueberries. Then I had a pepsi max and some Milka because I'm a fatty!" "Golden beets + lettuce in lemon vinaigrette, cauliflower rice, grenaille potatoes, olive oil-based chocolate cake"
"Runner bean and aubergine Keralan curry"
"Pad thai! Home made. No fish sauce. Ridiculously delicious." "Phoned in a curry :)"
"Pizza with my vegan cheese"
"Griddled halloumi, fried red onion, coucous and salad"
"One-pot gnocchi with halloumi, peppers, courgete, leeks and tomatoes & side salad"
"Quorn chicken & leek pie, roast potatoes, peas & sweetcorn"
"Veggie moussaka made with Quorn mince and aubergine"
"Homemade patatas bravas with salsa and sour cream and tomato & cucumber slad with croutons"
"Soup made from beans, tomatoes, carrots, swede, and broccoli (read: contents of the veg drawer)"
"Cheddar cheese sandwich, using sourdough spelt bread, rocket and cucumber,with a small amount of mayo"
"Thai green curry (quorn and general veg) and soba noodles on the side because I had no rice"
"Skyr with musli (too busy to cook)"
"Thai takeout over riced cauliflower instead of rice"
"Lentil lasagne and spinach salad"
Mmmmmmmmmmmmmmmmmmmm niiiiiiiiiiiice. That all sounds lovely. Have we learnt anything? Well, Quorn gets a decent showing (I notice that because I'm not into it myself), pops up 3 times versus halloumi's 2. At a rough guess, approx half of the meals rely on cheese. I kinda think I rely too much on cheese for veggie cookery. But there's a pretty good spread in the types of protein and the types of carbs people have in their meals. Anyway. It all sounds very nice. I've always thought fake meat was a bit silly. When I recently starting eating more veggy food I promised myself I wouldn't have to eat Quorn pieces, those fake chicken pieces that taste bland and (unlike chicken) don't respond to cooking. They don't caramelise, they don't get melty tender, they just warm up. If you like cooking, you're much better off cooking some actual veg. 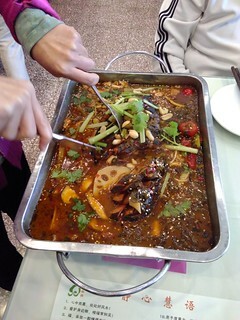 In Beijing, there was this braised fish dish, an extravagant centrepiece to a meal. A big pot of braised Chinese vegetables, and at the centre a mock fish steak. I don't know what it was made of but it had been slashed across the upper surface (like you would do with meat to get flavours in) and that upper surface was grilled and caramelised, while the lower part in the braising sauce was meltingly tender. 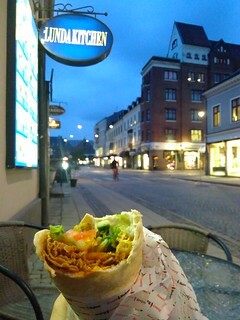 In Sweden, I got off the train in Lund and within a few minutes my eyes lighted on a kebab shop (Lunda Kitchen) with a massive list of things labelled "vegan": burgers, kebabs, pepperoni pizzas... My host actually said that he thought "vegan" probably didn't mean the same thing as it did in English. Anyway it does. Their vegan doner kebab was just ace: just meaty and spicy enough, all the trimmings as usual. 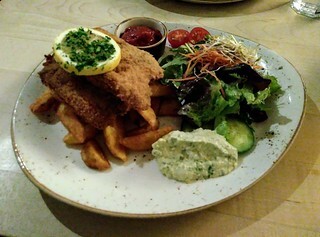 In Germany, I had this literally unbelievable vegan schnitzel (at Max Pett, Munich). It wasn't just that it had the taste of a breaded steak "Wiener art", but also the structure, the resistance and texture you expect when you cut into an actual schnitzel. The only reason I didn't grab the serving staff and double-check whether it was veggie or not was that I was in a very definitely vegan restaurant. 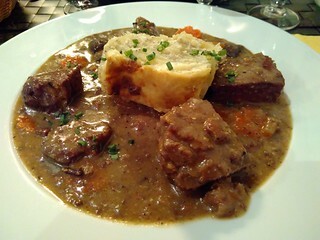 In France the seitan bourgignon was a great idea but the execution wasn't ideal. However we had excellent seaweed "tartare" and artichoke "rillettes", both of which captured specific je-ne-sais-quoi tastes of the traditional dishes they were paying tribute to. These were in various Paris vegan bistros. In India... I didn't have any fake meat at all. I had some amazing dishes, since they've a massive history of veggie cuisine of their own, but it doesn't centre around fake meat. Their first cheese is a vegan mozarella. We unpacked the cheese and had a taste - yes, a good clear taste like standard mozarella. But they've worked on getting it right so it goes melty and gooey, and browns nicely in the oven. 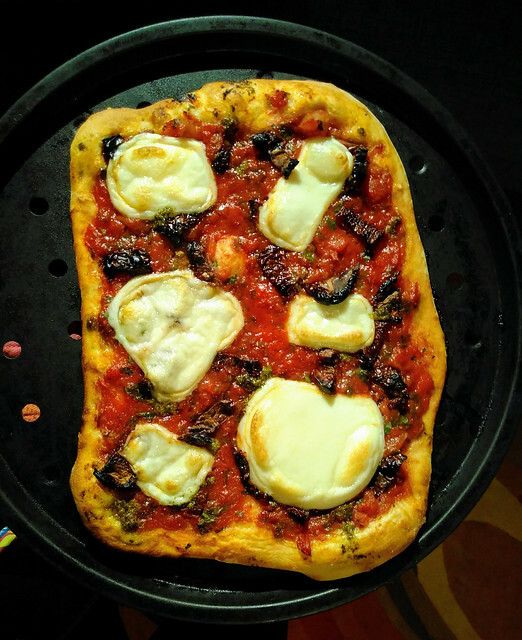 So let's try it on a pizza! I just spent a couple of weeks in northern India (to attend IBAC). Did I have some great food? Of course I did.